Twitter hit a two-and-a-half year high Wednesday after its CFO said the company was creating a new subscription product geared toward businesses. Twitter CFO Ned Segal says the social media platform has not done a good enough job in helping businesses use the platform to its full capabilities. You can see Twitter’s current stock price here. 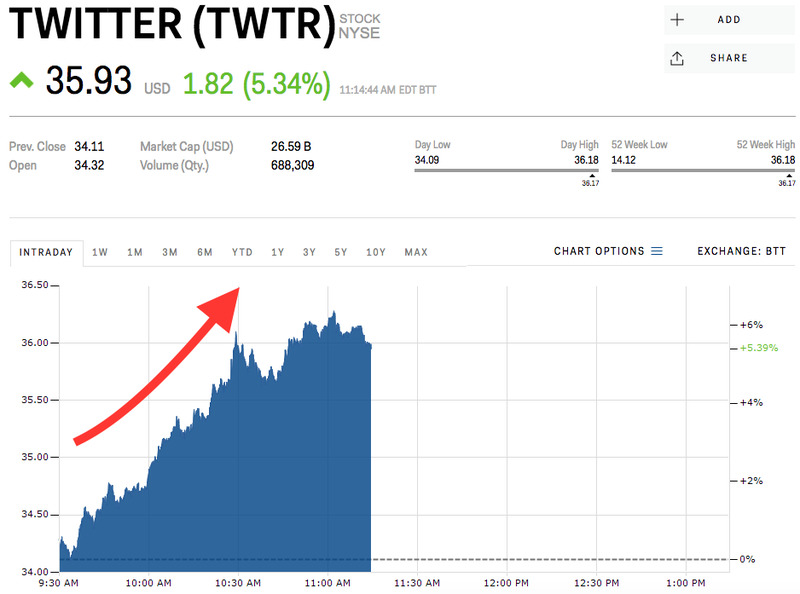 Twitter hit a two and half-year high Wednesday, up 5.89% at $US35.93, after CFO Ned Segal said the company is rolling out a new subscription product geared toward local businesses. Though Twitter has done a good job getting local news to individuals and businesses, it has not done a good job in getting the millions of local businesses that are on its platform to tap into its potential, Segal told CNBC in an interview. “We’ve done a lot of work there recently to create a subscription product for them so that they can advertise easier on Twitter, but there’s still a lot of work to do to get more of them on Twitter today,” Segal said. Segal also said he wants to make it easier for businesses to use Twitter’s treasure trove of data. The social media company will sell some of its data to companies to help them launch more successful ad campaigns and position itself as an attractive advertising partner. The announcement comes on the heels of a strong quarter, which saw Twitter report its first profit in the more than four years as a publicly-traded company. Since its earnings beat on February 8, shares of Twitter have climbed roughly 15%. Its up 47.4% for the year. Read more about why one analyst thinks Twitter’s fortunes may have turned for the better.